Explore the unknown mysteries of hidden worlds in Season 2 of The Paranormal Zone, hosted by Li Kim. Venture into the realm of the dead and the supernatural; meet researchers that bridge the gap between spirit and science; and explore the ancient art of sacred tattoos and the historical practice of necromancy. All this and much more presented by the amazing Li Kim in this reality-based documentary series. "What we see may not be real and what is real we may not see." 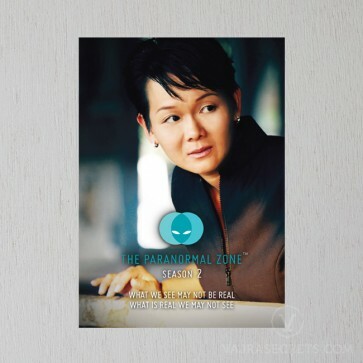 Explore the unknown, the unconscious and the mysteries of the hidden worlds in Season 2 of The Paranormal Zone, hosted by Li Kim. Watch, as she invites you to delve into the realm of the dead, talismans and magic oils. As she investigates the supernatural dimensions, she will also shed light into the domain of mysticism by taking you to meet scientists and researchers that bridge the gap between spirit and science. To stretch your imagination further, join a group of dragon believers as they speak of tales of this great beast living amongst man and find out where animals go after they die. Travel to Thailand with Li Kim as she draws you into the ancient art of sacred tattoos referred to as 'Sak Yant', and the historical practice of necromancy involving spirits of deceased babies known as 'Kumantong' or the Golden Child. What are the truths and motivations behind these spiritual commitments? All this and much more presented by the amazing Li Kim in this reality-based documentary series.